Are we all just liars? | Save. Spend. Splurge. Home › Money › Discussions › Are we all just liars? Okay, that was a controversial title, but it makes me wonder if people think that. I was reading through comments on blog posts about how much you should have saved by the time you’re 30, or how much you need to have in your retirement accounts by 30. What struck me the most about these comments, is that the people who say they have over 6-figure incomes and over 6-figures saved as their net worth by the time they’re 30, are met with (warranted) skepticism. …I have no way of proving that I have this money saved (nor do I care to), but… I do. I simply fell into my profession, a bit by luck and a bit with hard work, and I fell into it early in my life. It’s a career for me, not just a job, and I think you’ll find a lot of people who are happy with what they have, say that often. 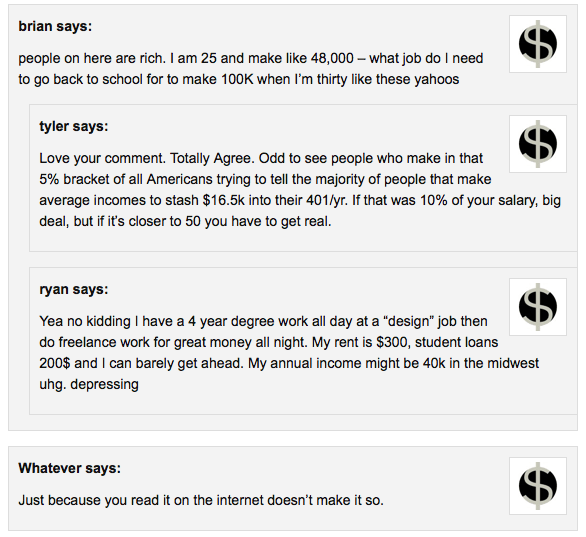 However, by the same token, plenty of people with the same degree as I have (business), aren’t making 6-figures. Everyone’s situation and circumstances are different. To say that’s it is impossible to earn over 6-figures when you are in your mid-20s or 30s, is like saying it is impossible to earn LESS than $10,000 in your mid-20s or 30s. Or that people who make $1 million a year, don’t exist. Ever notice that when you stumble across these blog posts, people are making a killing in their salaries, saved up $500K by the time they were 35, have 4 kids, and do it all with only one working spouse? If statistics tell us time and time again that most Americans DO NOT make $100,000+ a year, and that by the age of 30, we’d all be lucky to have at least $8000 saved from having crippling student loans, it means that these people (myself included) are in the minority. And we’re a minority that is interested in money. Specifically, OUR money, and how to grow it. This is why we go to PF (personal finance) blogs, read about money, talk about investments, are interested in saving for retirement and are generally guilt-ridden if we don’t save every penny that we can because we see other people working just as hard as we do, making less and saving as much, or more. The majority of people who don’t have such situations, probably find talking about money that they don’t have, to be extremely boring and plain depressing — just as I did before I realized I had to do something about my student debt. Not to mention all the internet lurking that goes in, with very little commenting. I think if I weren’t in that position, I’d be skeptical too. Heck, why aren’t you skeptical of ME? Aside from those of you who have met me that is. I’m just some Anonymous person who posts about her money online, and happens to love eating French and Japanese treats. And really, who the heck could imagine that by 30, with only 7 or so working years under your belt, you would have saved at least $100,000? That’s about $14,000 a year. Net. It’s kind of ludicrous, so I see their point. Especially if they’re making $28,000 a year gross. Most people can’t even scrape together enough money to cover their student loans, let alone think about maxing out their retirement funds. AS FOR HOW TO MAKE MORE MONEY? Apparently the plum career is to become a kickass pharmacist. No really, the bottom line and the advice you will hear most from people is to figure out what you want to do, what you like to do, and find a way to make money from that. What works for one person, will not work for another. There is no magic bullet, or answer that will solve everything and hand you tons of money on a silver platter. I may absolutely love my job, but would be a TERRIBLE pharmacist. I’d rather make less money at my job than more in something I don’t enjoy….. although I do realize that it’s very easy to say that when my job already pays very well. Anyway, the point is to find what you love to do…that makes money, and to be happy with your situation because you’re doing the best you can. When I get cranky about life, and boo hoo to myself about first world problems, I always think that it could be a lot worse and I STFU. I gravitate toward PF blogs because, like Vanessa said, I am interested in controlling and increasing my money, even though I don’t make a lot of it. I think I am less skeptical of people who share more of their personal lives. I don’t have to (or want to) know everything about a blogger, but if the posts are all ONLY about money and what to do with it, I A) am not as interested, B) can’t relate (especially if they’re talking about a lot of money. My stipend is less than 30k/yr! ), and C) can’t picture them as a person as well, which makes it harder to believe that someone really has that much money to work with at such a young age. Oooo so it would be hard to believe because age and income factor in? I happened to fall into my profession as well, it’s my passion and I don’t think I would want to do anything else. I guess some of us are lucky, but it also comes with a lot of hard work. Personally I put two thirds of my salary aside every month and still have quite a bit to live off of, but I wonder if there are smarter things I could do with my money. I am sure there are but I don’t know how… Any tips? Invest. That’s all can I suggest because that’s all I do. You could buy property but I know 0 about that and it sounds like a hassle to me. I think you are right, I have been thinking about investing for a while now, but I am clueless as to how it actually works. I mean I guess I know the basics about bonds, stocks and the likes, but I don’t know how or where to open a portfolio or what exactly to invest in for example. Any tips on that? I would start by learning about mutual funds such as index funds and go from there. Just google the words and there are tons of PF sites that’ll get you started. I feel weird about that sometimes and think “Maybe people don’t want to read about my net worth increases when my income is over six figures” and then I realize that the majority of comments I get at least are from people in similar situations. “I simply fell into my profession, a bit by luck and a bit with hard work, and I fell into it early in my life. This is exactly my situation. I’m in software because I grew up with a passion for it. It’s not something that I watch the clock doing. It’s something that I enjoy doing and occasionally do on the side as well. I’ve met people though who don’t know that you can put $17,000 into their 401(k) each year. No one tells them this. I only learned this from reading PF blogs when I finally found some that weren’t of people just starting out. The joke in my industry is that only people who don’t want to make a living go into research since you can make so much money with just a Bachelor’s degree. I think we are all drawn to people with similar situations so we can improve on OUR own net worth. 🙂 tips and tricks! We are certainly not the norm. It is a subject many people don’t bring up often enough with friends. Wow, I never really considered the idea that some bloggers who make extreme claims could be lying. Having paid off a sizeable chunk of debt in a reasonably short period of time, I never really felt the need to question how someone else did it. I just assumed their circumstances were different than mine. At 25 I was making close to six figures and maxing out my retirement account, but I also live in an area where it’s fairly easy to do if you’re interested in the work. In all honestly when I read comments criticizing people who can and do make their financial dreams a reality, I tend to criticize the commenters. They’ve got their head in the sand, they don’t want to stop consuming, they’re lazy, they’re trolls… I never stopped to consider the fact that what the writers are talking about is so far outside the norm that it seems like lying. It’s absolutely food for thought. Great post! I suppose there is an element of trolling involved but there is also skepticism that this actually happens and had happened, unless you know someone in real life who has done it. Hmm…. Not really. They may SAY things but I can see when they an afford things or not. They don’t fool me because I can judge their unconscious actions. On the Internet, I have no cues and neither do readers other than pictorial ‘proof’ of trips and things we buy. True… and pictures can be found and copied. On the other hand, the good side of success and accomplishment is always hard to see. When you meet a millionaire who drives a 15-year old cheap car you may not have many clues as to what they’ve really done. Online, someone can make up any story they want. But you can still get inspired and actually do what they talked about which makes you better off. As long as it inspires you to change, it is always good thing. Or at least to look at money differently. I don’t doubt that a lot of comments (and even many blog posts) are slightly exaggerated (which is a good lesson in figuring out what you can trust). On the other hand most blogs with lots of negative/exaggerated comments aren’t providing the best information in the first place. I just look for those who are consistent and detailed enough to be believable. For all I know you’re making it all up but I believe that *someone* could do this so it gives me a nice challenge 🙂 And while I keep trying to do better, I know there are things I’ve already done that would be unbelievable to the average person. In the end it rarely hurts to try something “impossible”. You’ll learn not to expect to earn $500,000/year while working 4 hours/week at something you’ve never done before, but at the same time you’ll probably start doing other impossible things. Or when it comes to saving: if you try to save 50% of your income and only make it to 40%, congratulations! You’ve failed your way to the top! I like that — failing your way to the top. I don’t claim to make THAT kind of money but I do know I am not the average. That said, what keeps me grounded is knowing people live on much less and challenging myself to do the same while enjoying my life (traveling for instance). Plus, saving a lot of money helps you feel secure each year when you want to take time off because you need it. If only we COULD meet 🙂 I’m not going near CA anytime soon unfortunately!